Located between Rows 43 and 44. The COLCHESTER INN to c1901. 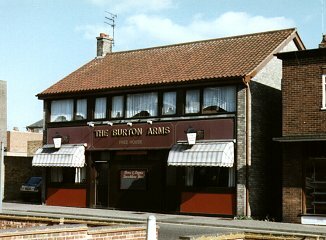 Became the BURTON ARMS HOTEL 11.07.1924. Chief Constable B. W. Smith objected to licence renewal at the Annual Licensing Sessions Friday 12th February 1932. The Chief Constable againobjected to licence renewal Friday 18th February 1938. Demolished April 1959 and rebuilt.